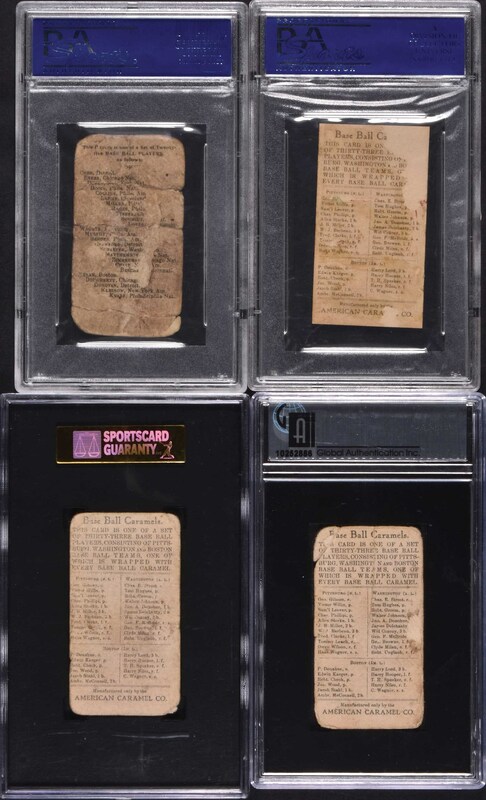 Very presentable collection of seven modestly-graded 1910-era caramel cards representing five different classic sets, all featuring Hall of Famer Honus Wagner. 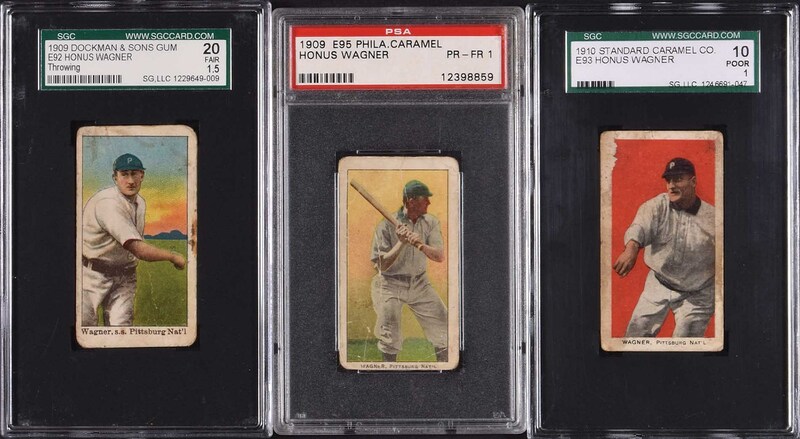 Each card is graded and encapsulated by PSA (3), SGC (3), or GAI (1). 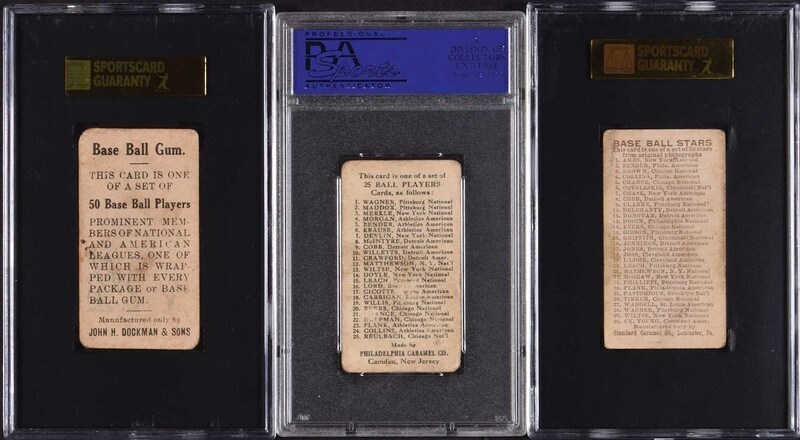 1) 1910 E102 Anonymous "Set of 25" Batting. PSA PR-FR 1. Heavily worn with excessive creasing. 2) 1909 E92 Dockman & Sons Throwing. SGC FAIR 20. Multiple creases and light staining accounts for the assigned grade. 3) 1909 E95 Philadelphia Caramel. PSA PR-FR 1. Excessive creases and heavy wear accounts for the assigned grade. 4) 1910 E93 Standard Caramel. SGC POOR 10. Paper loss in the upper left and light soiling on the borders accounts for the assigned grade. 5-7) Three 1910 E91-C American Caramel. PSA Authentic (trimmed), SGC POOR 10 (several creases and heavily worn), and GAI POOR 1 (heavily worn with excessive creases and upper right corner torn). 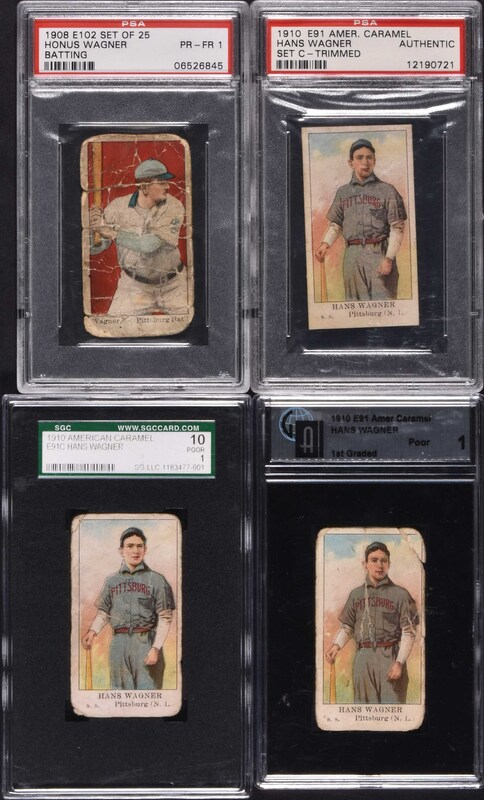 These examples provide an excellent opportunity to acquire presentable yet relatively affordable alternatives to far more expensive higher-grade examples of these classic Honus Wagner cards. Total: 7 cards. Reserve $300. Estimate (open).